Like MONEY magazine too for tips on saving more, investing better and spending wisely. This New England town is surrounded by a wealth of good jobs in Boston, Providence, and the Route 128 tech corridor. That helped insulate Sharon from the worst of the recession and ignited its rapid recovery. A half-hour train ride from Boston or Providence, this one-time summer resort has the natural beauty of a more remote place. 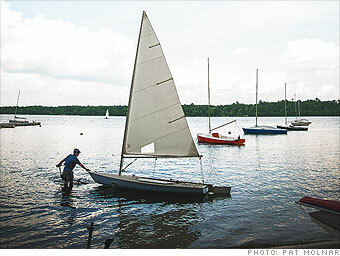 Forty percent remains open space, and the town jewel, Lake Massapoag, offers a place for residents to swim, picnic, and enjoy concerts on Memorial Beach. 17 states have statutory provision for automatically adjusting to the rate of inflation the dollar values of the income tax brackets, standard deductions, and/or personal exemptions. Massachusetts, Michigan, and Nebraska index the personal exemption only. Oregon does not index the income brackets for $125,000 and over. Is Sharon a great town, or what?